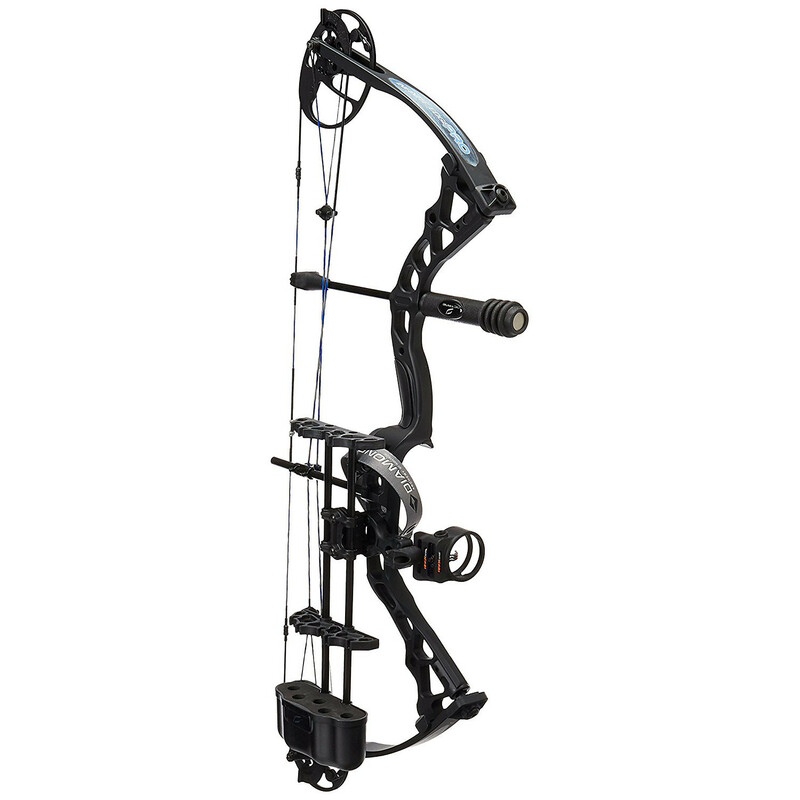 The excellent customization options allow any shooter to adjust the bow to his or her liking, without any trouble. Its particular design, with solid limbs, and lightweight construction, makes it ideal for any situation, in the field or otherwise. It is a compound bow that can be used for various activities. The peep sight is not pre-installed; some may find this a drawback to an otherwise excellent compound bow. While looking for the most versatile compound bows out there, you will feel hard pressed to find one that fares better than the Diamond Archery Infinite Edge. It is clear that the manufacturer thought about providing its clients with the most generous array of adjustability options out there, and the result is outstanding. For the target practice shooter out there, as well as for the seasoned hunter who wants a reliable weapon for hunting down prey, it is an excellent buy. The fact that it comes in the same package with an array of extra accessories that can make your life easier adds to its incredible value. The company in charge of making this beautiful compound bow has a long-standing tradition in making hunting gear that is designed to last for years, without showing signs of wear and tear. It is clear as day that this compound bow is no exception to the rule, and this is not all. Improving a previous design that was the company’s best seller for years, the manufacturer managed to pull an even more coveted compound bow that took everything the model from before had and just made it better. The dedicated fans of the hunting gear maker are more than pleased with the improvements, and the overall build of the product remains as durable and reliable as for the best seller model. The aluminum components lend the model durability while keeping its weight at a comfortable 3.2 lbs. The handmade string, created by Octane, is of the same high-quality as the rest of the bow. The solid limbs are durable, too, and they might be preferable to the split limb construction other compound bows come with. You can get this bow for right-handed and left-handed archers, so there’s no limitation to worry about in this respect. With a draw length varying between 13” and 31” and a draw weight that can be adjusted anywhere between 5 and 70 pounds, it is no wonder that the uses for this bow are so extensive. Reaching a high velocity of 310 feet per second, the bow we review here offers superior performance, and helps you pick the right weapon for your next hunting trip with ease. From axle to axle the bow measures 31.5”, so you might not have a problem when hunting in cramped places. The brace height, at 7”, is adequate, too, and the fact that the let-off for this model goes as high as 80% tells something more about its versatility and how well it adapts to any situation and any shooter who wants to use it. If you have preferences in regards to the appearance, you can pick between the BlackOps design, the camo Mossy Oak Infinity pattern and Pink Blaze. We would not be able to talk about the features of this bow, without mentioning the plethora of accessories that are delivered with your purchase. The 3-pin tundra sight along with the peep sight that is provided will help you take aim and land accurate shots with ease. A stabilizer, as well as an arrow rest, are offered, too. The latter does not have a complicated design, and that’s good, because there are no mechanical parts involved, and the risk of it breaking is reduced. A quiver that can hold up to five arrows is a nice touch and will make young shooters happy when offering this package as a gift. Other accessories included are a string loop that lets you attach a release aid and a wrist sling that will keep the bow attached to your hand after releasing an arrow. 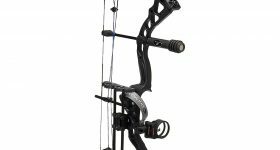 The particular design of the dual cam system with bearings that are encased into the cams contributes to the overall excellent performance of this particular bow. Twin cams may be known for being a bit noisy, but you don’t have to worry about such a thing. Any hunter worth his or her salt can tell you that making noise in the woods is guaranteed to send your prey running away, leaving you empty-handed. What you need is a good quality bow that will be deadly and silent. With the help of the ultra-light stabilizer that this model comes equipped with, the vibrations in the strings are stopped efficiently, and you won’t have to worry about the noise. One thing that we should add here is that the stabilizer works pretty well, and you won’t have to invest in other accessories, such as silencers. If you want a versatile bow, the Diamond Archery Infinite Edge is an excellent buy. Packed with features that extend its usefulness and durability, it is the type of compound bow that doesn’t leave you wanting for extras. Speaking of extras, the nice selection of accessories offered with this model will convince you that you should not opt for other models on the market. Ideal for target shooting, hunting, and archery, it is a great choice that you should at least consider on your shortlist.